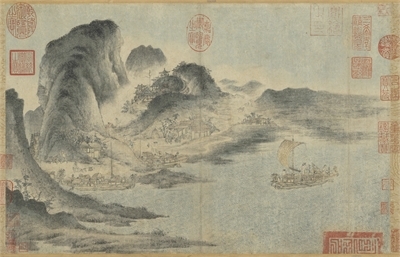 This painting depicts two peaks rising to encircle a town with a mountainside temple and countryside shops here and there. The temple buildings are on a level outcropping and constructed up the slope. The valley below is filled with clouds and mists as birds fly about, conveying the sense of a scene at dusk. The brushwork used in depicting the motifs here, including the boats, figures, buildings, trees, and water ripples, is refined and delicate. In particular, the structure and facilities of the boats and architecture of the temple buildings and village shops are meticulously rendered, the figures lifelike in both form and spirit. The scenery, concentrated mostly in the left half of the composition, is quite naturalistically portrayed, and the coloring is also pure and simple yet classical as well. Despite the small size of the painting, the artist's use of washes and dots make the scenery come to and overflow with life. The work bears no seal or signature of the artist, but the style of brush and ink suggest a masterful rendition close to the time of the Northern Song artist Yan Wengui (967-1044).